At times, women of any age may require surgery to help them return to optimal health. The gynecological surgeons at Rosemark Women Care Specialists are highly credentialed and widely sought after surgeons with skillful expertise. 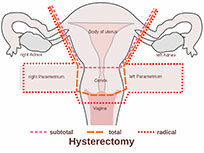 A hysterectomy is a surgical procedure that is conducted to remove a woman’s uterus. There are several reasons a hysterectomy may be performed including chronic pelvic pain, excessive vaginal bleeding, endometriosis and painful uterine fibroids. The Rosemark surgeons are trained in the most advanced and non-invasive hysterectomy procedures that minimize recovery time. When women suffer from pelvic organ disorders like pelvic organ prolapse, surgery is often the best method to surgically support the dropped organs. Pelvic reconstruction surgery is performed in the hospital and the results can help return women to their best health. When a woman does not want to become pregnant, permanent sterilization is a method of birth control. Surgery may be the only option for some patients but there are a few methods of permanent sterilization which the Rosemark surgeons perform that are non-invasive and can be completed at our office without hospitalization. Urinary Incontinence is a pelvic disorder that is caused by weak pelvic muscles that trigger uncontrollable wetting. There are several surgical methods that can be used to treat patients that are suffering from this, sometimes embarrassing, condition. In situations where excessive menstrual flow from the uterus becomes excessive and becomes a serious problem, a surgical procedure called uterine ablation can be performed to reduce or end the blood flow. While surgery may be necessary, there are methods of endometrial ablation that can be performed in-house at Rosemark. Uterine ablation surgery will require hospitalization.